I haven't had a baseball cap since I was a kid and to be quite honest I really wasn't a fan of them back then. They were always too tomboyish to fit into my girly style but like many things in recent years my opinion on these hats is taking a 180. Especially now with so many new spins on this style of hat including leather, sequins, and fun colors I am discovering a new found love for this all-American classic. This (pretty pinks), this (lovely eyelet), this (fun florals), and this (more florals!) are some current favorites for the warmer weather. I've never been a huge fan of baseball caps but whoa those white floral pants are amazing! UM YES! I love all of these looks! I like baseball cup!! Great outfits!! Great looks with the caps! I don't think I can ever rock booty shorts, a ball cap and heels but I'd certainly try the trend out! I love the different takes on baseball caps! The monogrammed ones I've seen places are super cute and that blue one is adorable! I'll have to dig some of mine out of my closet this summer! i just bought a couple of caps. mainly for sun protection. these are really stylish. Every single look is so adorable...thanks for the inspiration on how to cute-fy the baseball cap! 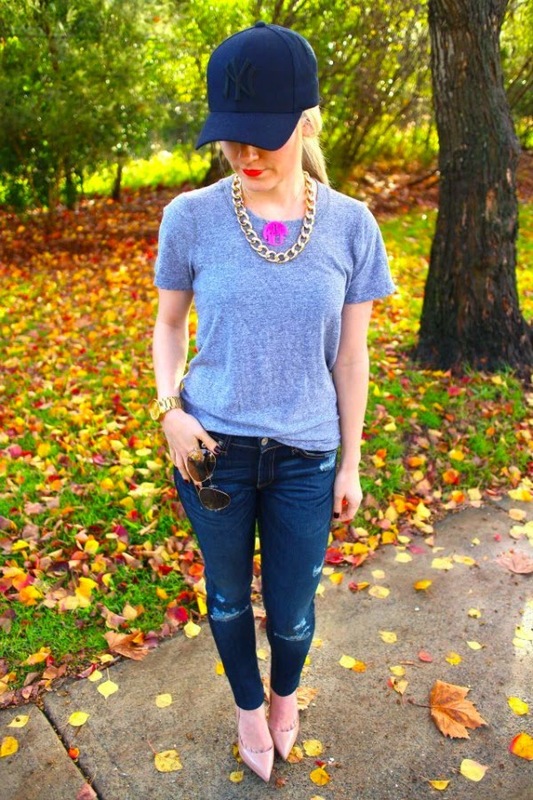 Love all of these baseball cap adorned looks!